Grow Spiritually, Connect with Others, and Make a Difference. At Memorial Baptist Church, we work to emphasize people and relationships over programs, and we believe that it is critical to be involved and building those relationships both inside the church and within the community. These are some of our active groups – check the Calendar for updated information. Deborah Circle: Promotes meaningful and caring relationships among participating Christian women through prayer, sharing, and participating in service projects together. We also seek to gain biblical perspective and knowledge through the informal discussion of spiritually-based selections. Meets on the first Tuesday of the month at 12:30 pm. Hannah Circle: Meets for fellowship around the coffee cup, engaging in Bible study, sharing concerns with one another, and responding to needs inside and outside the church. Meets on the first Wednesday of the month at 10am. Joyful Noise: The praise band for Memorial Baptist Church consists of a number of musicians and vocalists who help begin the worship service. We welcome new musicians to come and join in sharing their gifts. Loaves & Fishes: We participate quarterly in this this community-wide program which provides hot meals for persons in need. 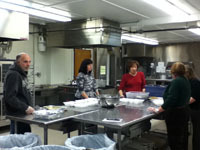 Volunteers are needed in donating lasagna (or lasagna casserole), baking or purchasing cookies, and helping serve the meal on our designated days. Memorial Baptist Choir: The Memorial Baptist Choir assists in worship services from September through May, performing a variety of sacred choral music. The choir meets weekly on Wednesday evenings and welcomes additional voices. Men’s Breakfast: Gathers on the third Saturday of each month for a time of conversation, good food and an opportunity to dig deeper into what it means to live out our faith as men of God. The group also supports different ministries throughout the year. Youth Group: For students from Middle School through High School; the MBC Youth group explores what it means to follow Jesus by combining times of discussion and learning with participating in hands-on service projects and fun activities. The Youth Group meets every other week on Wednesday evenings. Yarn Ladies: The Yarn Ladies gather on one Saturday morning every month September through May to knit, crochet, drink coffee, tell stories, laugh, swap patterns and just have a good time together. 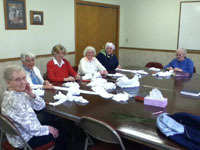 Experienced knitters and crocheters help the novices, and group members range in age from 15 to 90. Bring your own project to work on, or use donated yarn for a service project like baby items for Youth for Christ’s Teen Parents Club, or hat, scarf and mitten sets for Salvation Army and Solutions Center.